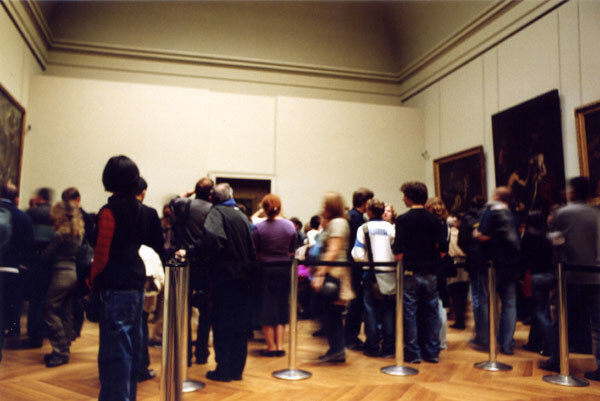 Ten to fifteen lines in front of the painting. Constant flashes from cameras - which people hold above their heads. A madhouse. I wanted to have a look at the painting you see on the right (I don't quite remember what it was anymore - I think a Botticelli), but an angry guard told me not to stand still. To get there, you have to walk all the way down a long wing, filled all the way with art from the Italian renaissance. Some really beautiful works there. We took over an hour to walk it slowly, you can see how the artists discover perspective, how they refine their technique, the light gets more vibrant and realistic, faces come to light. And it's amazing how many people just pass them by, on the way to that one painting at the end. Posted on 15:06, 29 march 2005.